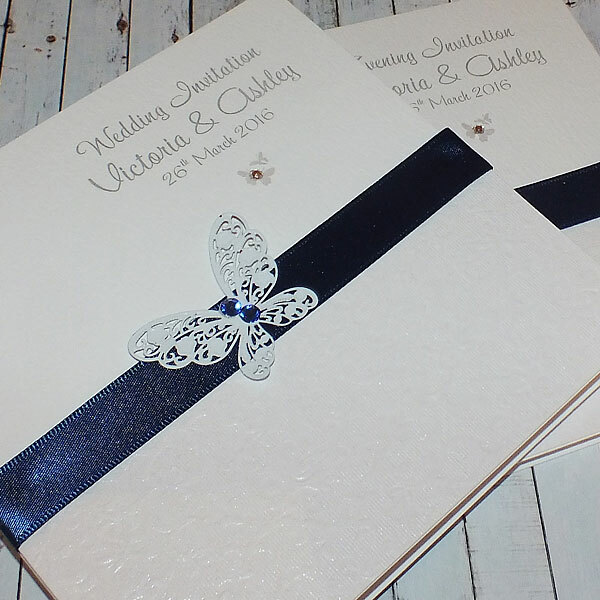 Beautiful metal butterflies in black or white feature on this luxury wedding invitation. 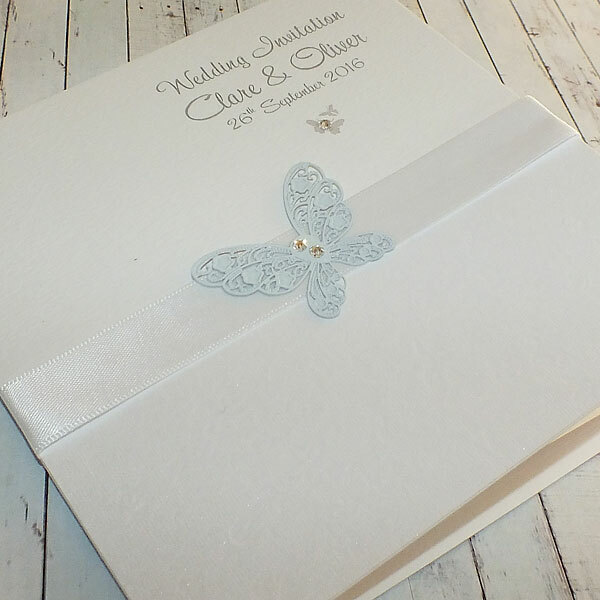 The invite design is embellished with Swarovski diamante crystals and a luxurious satin ribbon. 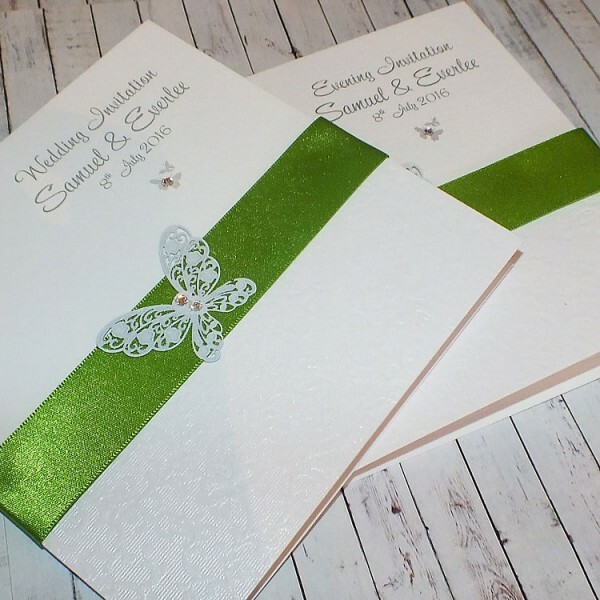 Created on your choice of textured white, ivory or cream card and supplied with white inserts and envelopes. 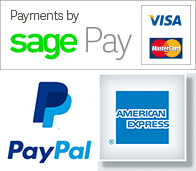 It can be used or DAY or EVENING wedding invitations. 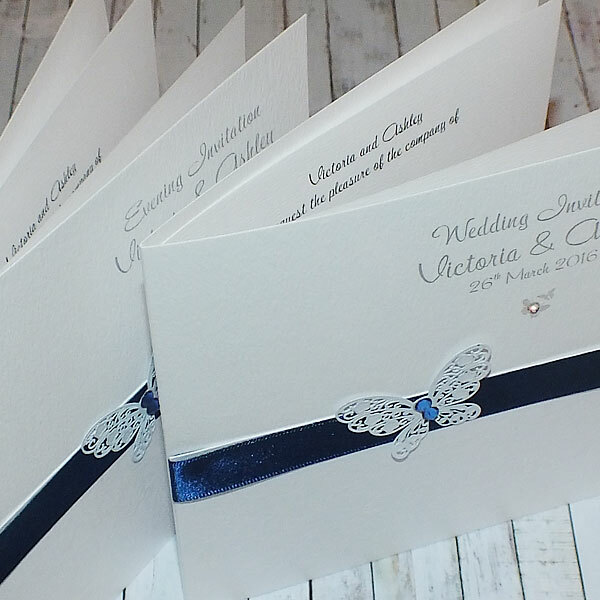 The invites are fully personalised with your own choice of wording and fonts. The HARRIS design is available in any colour scheme to match your wedding and we are happy to match to a colour sample. If you let us know your colour scheme when placing an order for a sample, we will send you a swatch of the card colours available. Harris Design Handmade Wedding Invitations - Pocketfold wedding invitations HARRIS POCKETFOLD..
Harris Butterfly Design Handmade Wedding Menu To co-ordinate with our Harris wedding inv..
Harris Handmade Wedding Order of Service, Order of Ceremony, Order of the Day The HARRIS..
Harris Flat Handmade Wedding Invitation for Day or Evening HARRIS FLAT WEDDING INVITES can be.. 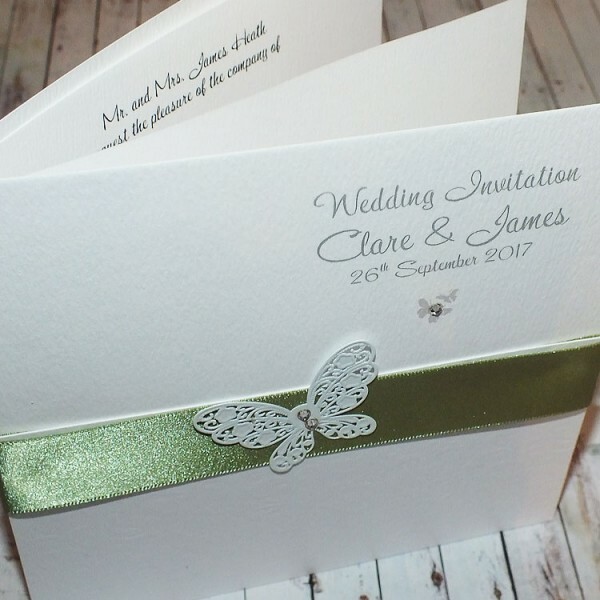 Handmade Table Name or Number Cards "Harris" These co-ordinating TABLE NAME OR NUMBER CARDS m..
Harris Wedding Thank You Card Designed to match the Harris wedding invitation range,&nbs..
Harris Butterfly Handmade Personalised Place Cards Designed to match the Harris wedding stati.. Matching Harris Personalised Reply Cards Designed to match the size, colour and font style of..
Harris Purple Handmade Wedding Invitations - Pocketfold wedding invitations PURPLE POCKETFOLD..
Harris Colour Schemes Harris wedding invitations can be made to suit any colour scheme. Th..